As predicted, kingfish appeared offshore over the past week. Among anglers to catch kingies to 65cm was a client of Gone Fishing Charters’ Chris Vasilevski, boating one while targeting snapper. Anglers chasing kings offshore should try fresh squid strips as bait or 7” Gulp jerk shads in pearl white on 1oz jig heads to either sink deep or be cast long to the feeding fish on the surface, depending on where they are in the water column. Salmon to 3kg can be expected as bycatch. Corio Bay’s inner-harbour fired for flathead, with the grammar school lagoon producing fish to 50cm. Casting soft plastics was effective, while bait anglers had success with bluebait or squid. Alcoa Pier and the nearby spoil grounds produced pinkie snapper, flathead and pike for anglers drifting in 4m to 6m of water. Salmon were holding around the pier, although one angler was under-gunned and unable to stop two sizable kingfish after casting a big plastic at them on the surface. 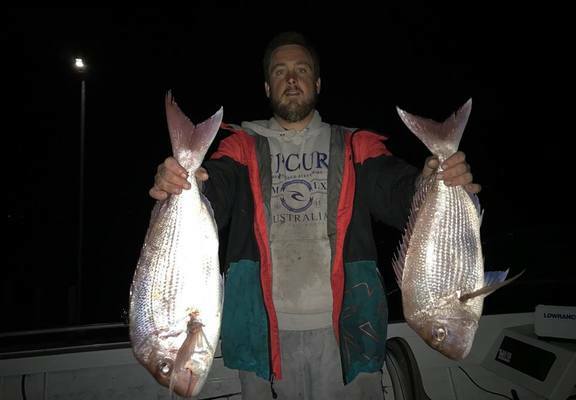 Sam Pitman fished Clifton Springs during an afternoon tide change, catching two snapper around 3kg on squid. By all reports, early mornings and late afternoons aligning with tide changes were ideal for snapper in the bay. Freshwater fishing was great, with a number of lakes producing brown and rainbow trout. Lake Tooliorook’s jetty fished well for brown trout to 1.5kg on Powerbait, while Lake Bolac gave up some big rainbows again after being quiet for a while. Ballarat’s Lake Wendouree was a hot spot for big browns after dark. Casting mudeye flies from the bank accounted for fish around 2kg, although bent-minnow lures and mudeyes fished floats also got results.